My studio machines are humming away making sweet toys for island visitors at Hendley Market in Galveston, Texas. 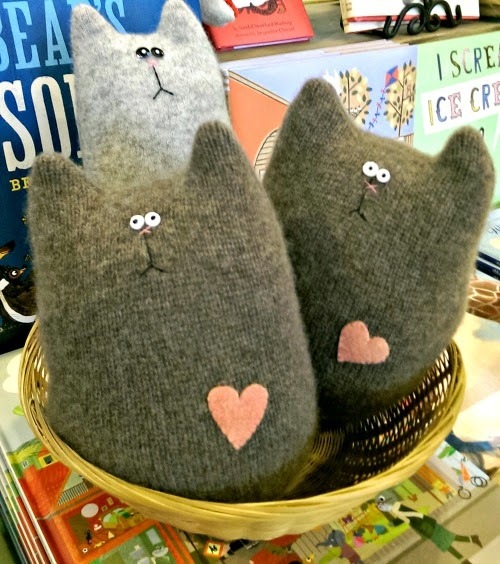 One popular item is the "Purrrfect Pet", aka- cats. This sweet up-cycling project is easy, affordable, and something the kiddos can help in creating. Supplies: old wool or cashmere sweater (Get crazy beyond solid colors- go for stripes and bold patterns! ), fiber stuffing, tracing paper, scissors, beads, thread and embroidery floss. Fold the tracing paper in half. On the fold sketch out half a fat cat form. Cut along outline. Unfold cat form to have a full cat pattern. Cut two of the cat forms from the desired section of sweater. Sleeves can be used having only to cut out the ears at the top. Machine stitch right sides together. Leave the bottom open. Turn the cat right side out and stuff. Using a gather stitch, pull the bottom closed and tuck the rough edges inside. Stitch a decorative circle to the base if preferred. Don't have any sweaters you want to chop? Check out your local thrift store. Not only do you get a great project for pennies but you also help a charity in the process.